One of the great things about being a dentist is the continuing education classes. Dr Brunner had the opportunity to attend a seminar about Acid erosion in February. It is something that is becoming much more commonly diagnosed in dentistry. So, here are some things we think you might like to know! What is erosion? 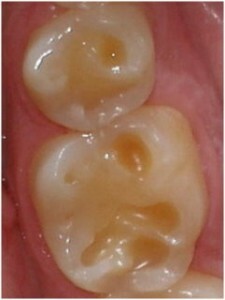 Erosion is the chemical loss or destruction of tooth structure. Anyone can be at risk, however some higher risk categories include teenage males (due to extend of acidic food in their diet), teenage females (often related to bulimia) and the elderly (due to dry mouth). Erosion occurs due to a diet high in acidic foods or from acid reflux or indigestion. How do you know you have acid erosion? You or your dental provider may notice a pattern of cupping on your enamel or even enamel loss. Often times these cupped areas are mistaken for wear caused by clenching and grinding. These wear facets can put a patient at risk for cracked teeth, dental cavities, and breaking down fillings. Treatments for erosion include: 1: A diet lower in acidity. This means less soda, coffee and energy drinks, less acidic fruits, and less tomato based products. 2: treating acid reflux with prescription or over the counter medications and 3: restore broken down teeth as needed to maintain a sound tooth structure. Often times patients are not even aware they have acid reflux and the first signs present on your teeth. Detection and prevention not only save your teeth, but can save your life by determining a diagnosis. Un-diagnosed and uncontrolled reflux can lead to, bad breath, stomach discomfort, ulcers and even precancerous conditions such as Barretts esophagus. If you have questions regarding erosion or think you may have signs, call us today for an exam.